Sean has done various TVCommercials. He started out as doing extras in various TV Commercials such as Duty Free Philippines, Cafe Puro, Pepsi, Jollibee, Mcdonalds and a lot more! Finally he got his big break last 2002 when he did a TV commercial of BPI with Cindy Kurleto. Sean played the role of a nerd guy. In the same year, he did another TV Commercial of Jack and Jill Nova which was shot in Caylabne resort. 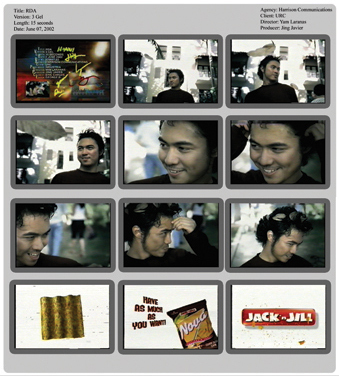 In the year 2003, Sean played as the double of JASPER in a series of Coca Cola Ad campaign. In the year 2004, Sean had another TV commercial of Enchanted Kingdom. lead family in Mano Po 3.